Note: these are still sticky and slightly messy, just like a traditional caramel apple. And totally worth it! Cut your apples in half and use a melon baller to scoop out the insides, leaving the walls intact at about 1/2 to 1/4 inch thickness. Squeeze the juice from the lemon onto the apples and allow to set. To make the caramel sauce, melt the caramel squares in a sauce pan over low heat, with the corn syrup. Allow to cool for about 10-15 minutes. Using a paper towel, wipe your apples down, removing the lemon juice as much as possible. 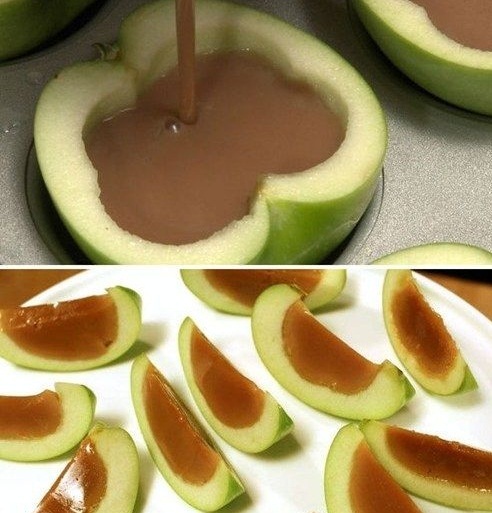 Pour the caramel into the hollowed out apples until just below the top. Sprinkle with pecans (if you desire). Be sure to stray away from nuts if allergies are of concern!! Chill in the refrigerator until the caramel has set, about 20 minutes. Cut into slices and drizzle with chocolate sauce, if desired. If you like egg rolls, this is amazing.